Pixelache | Welcome to Megapolis2026! News : Welcome to Megapolis2026! Upcoming in Helsinki on Saturday 15th October Dodo once again organise their Megapolis event, an urban festival which looks for urban solutions to environmental problems. This year's theme is 'energetic cities': "Energy often seems like a distant topic, despite the fact that energy issues are present in our everyday lives: in how and what we eat, in how we move and in what charges our iPods. When you look around you can see that the world is full of examples of sustainable energy production, low energy living, low carbon transport solutions and responsible consumption". This year Pixelache Helsinki, scheduled within the Pixelversity programme, contributes to Megapolis2026 with 3 artist-hacker-maker associations filling one of the upper rooms (2. kerros/floor) of Vanha ylioppilastalo / Old Student hall. 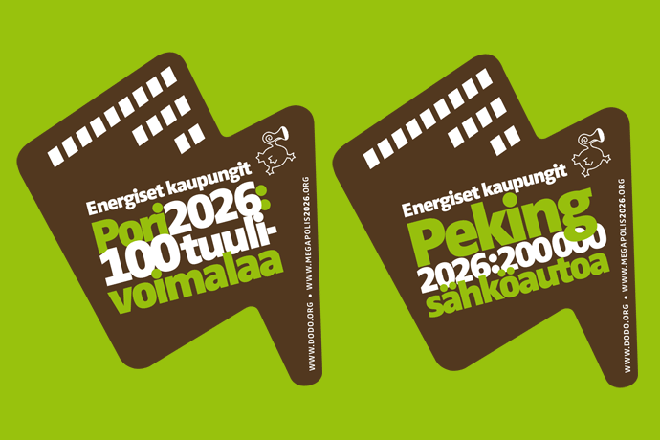 Kokeellisen elektroniikan seura (Koelse), Kodinkonemusiikin ystävät (Kokomys) and MIM Project (Tallinn) will demo and present different prototypes and discuss the relationship between art and energy from 14.30-18.00. More info here and Megapolis2026 website.